(Bloomberg Opinion) -- Last year, the wave of mainland money piling into Chinese technology companies pushed valuations into bubble territory. That made life difficult for foreign private equity firms that have to make new investments to survive — but there’s a glimmer of light at the end of this investing tunnel. Fundraising from rich Chinese entrepreneurs and shadow banks is drying up, so there could be less cash competing for returns in future. More than a third of private equity money newly invested in the Asia-Pacific region last year was in China tech and internet plays, according to Bain & Co. With so much money chasing a limited number of targets, valuations inevitably climbed: The median enterprise value for Chinese internet and tech takeovers was 31 times Ebitda, twice as high as for other industries in greater China and 2.4 times greater than the median multiple for Asia-Pacific deals in 2016-2018, said Bain. Even private equity firms that invested earlier in a Chinese tech firm’s fundraising process haven’t been doing as well as they once were. In 2014-2015, investors in greater China internet and technology firms exited with about 4.7 times the amount they put in, according to Johanne Dessard, a director at Bain. By 2016-2018, that had fallen to less than two times. A hefty 62 percent of private equity-owned Chinese internet and software companies that went public in 2017 and 2018 lost more than 30 percent of their market value in the first 12 months after listing. That compares to an average increase of 105 percent for companies that listed in 2015 and 2016. The honeymoon was bound to end, because the mountain of Chinese cash seeking returns has been shrinking. 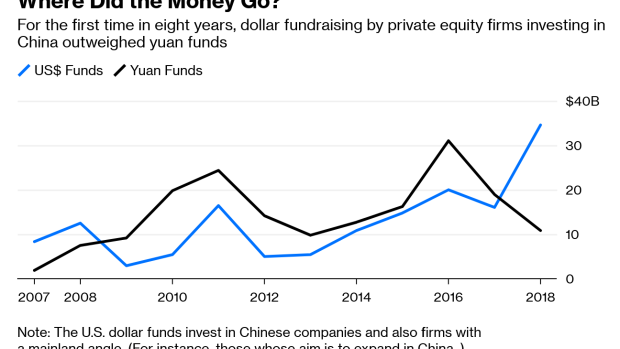 Yuan-denominated fundraising fell for the first time in eight years in 2018. Money from peer-to-peer lenders dried up amid Beijing’s crackdown on the sector, while China’s decision to put brakes on domestic IPOs to support the stock market blocked the exit door for potential investors. It’s been a striking reversal. After foreign and onshore firms were allowed to raise yuan-denominated private equity funds in late 2006, the segment raced to overtake the dollar market in Asia. With rich Chinese entrepreneurs and peer-to-peer lenders piling in, by 2009 yuan funds raised $9.1 billion, compared to $3 billion for dollar funds, according to the Centre for Asia Private Equity Research. That trend persisted until last year, when the government’s crackdown on the asset management sector plus a tanking stock market caused mainland investors to retreat. In 2018, $34.5 billion was raised for dollar funds while $10.9 billion was raised in yuan, with fundraising dominated by Hong Kong-based megafunds Hillhouse Capital Management Ltd. and PAG. Hillhouse raised $10.6 billion and PAG $6 billion in their most recent rounds. The other major source of onshore money is also drying up. Alibaba Group Holding Ltd. and Tencent Holdings Ltd. are still cash-rich, but they’re getting pickier about investing after high-profile failures like bike-sharing firm Ofo, posing a further challenge for startups already struggling with funding. The slowdown in mainland fundraising doesn’t mean the end for Chinese tech firms. There’s still a lot of dry powder: Committed but unspent capital hit a record $317 billion in the Asia-Pacific at the end of last year, enough to fund three years of investing at the current pace. And the Shanghai stock exchange is looking to set up a Nasdaq-style tech board, which may buoy valuations. That could be enough to allow foreign private equity firms to get a reprieve this year and pick some targets. After years competing with Chinese money for mainland targets, and losing, offshore investors may finally have the upper hand again.